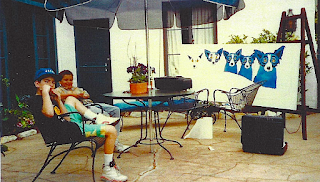 In the summer of 1991, George rented a commercial space in Carmel-by-the-Sea, California. Downtown rental property was at a premium and rarely available, and he required City Council approval to convert the former dentist’s office into an art gallery. The narrow, deep space seemed at first awkward for Galerie Blue Dog, and it relied primarily on artificial light. 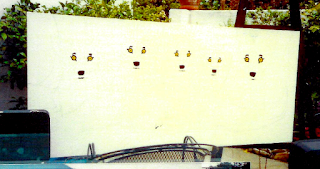 Its only window stretched 82 inches across, facing 6th Avenue, one block behind the main drag of Ocean Avenue. Attracting attention would be difficult --- especially that of art enthusiasts who might merely glimpse George's gallery from the corner as they walked to the well-known street. I remember the scene well. 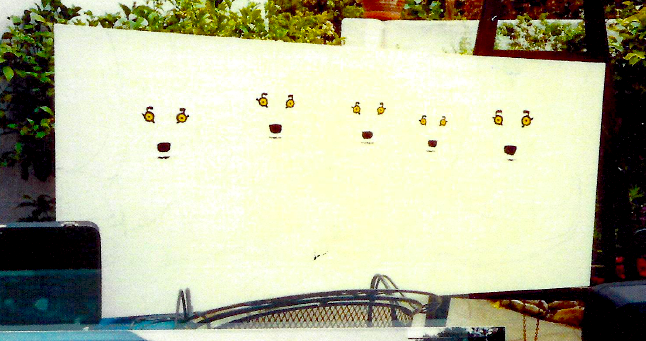 George stretched two canvases the exact width of the window, allowing space for a small display underneath. 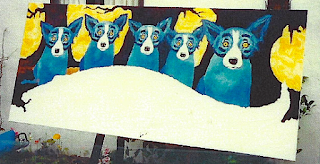 Facing inside, he painted a moonscape, with two dogs staring across the long gallery from above. Facing outside, he painted Lacoste Lineup, his first artwork created in California since his student projects at the Art Center College of Design in 1960s Los Angeles. 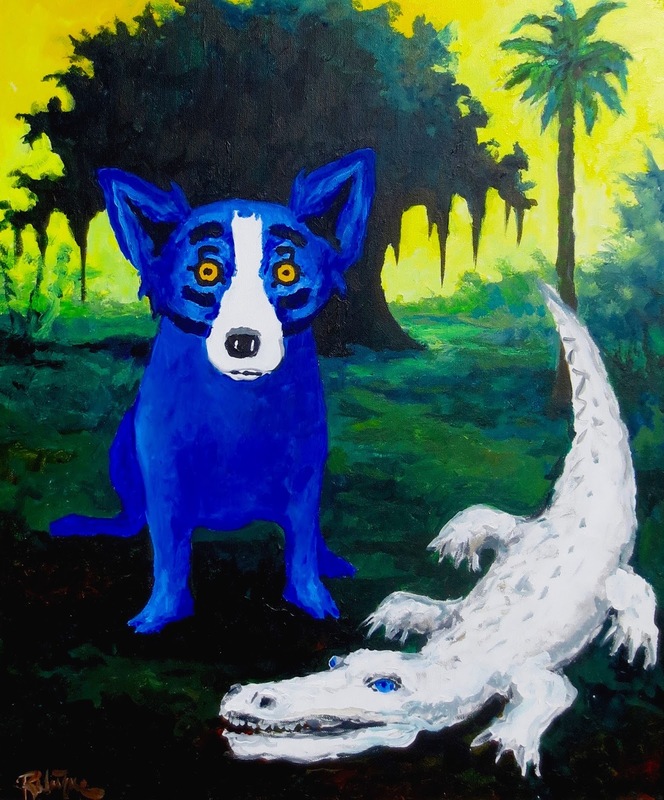 With its five Blue Dogs, Oak Trees, Swirling Suns, and Alligator, the painting announced a Cajun’s return to the West Coast, and the fulfillment of a dream he sought since Art School. 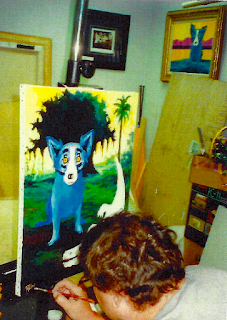 Today Rodrigue Studio Carmel occupies a brightly lit location on busy Dolores Street near the corner of Ocean Avenue. Rodrigue continued to paint for the gallery and its windows, but he enjoyed more flexibility in the larger space. 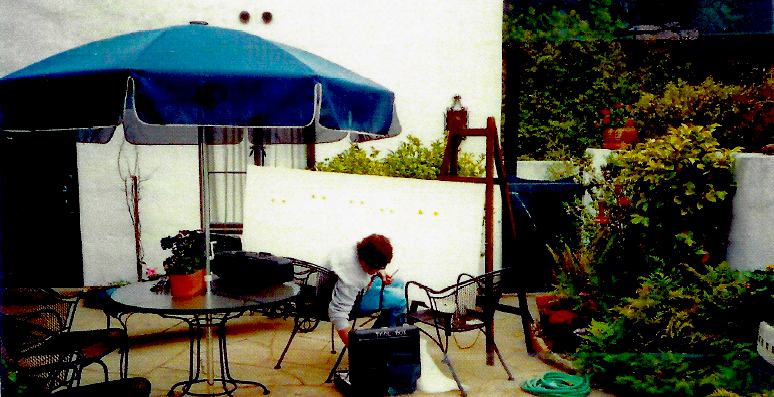 By 2000 we owned a home in nearby Carmel Valley and George painted most of his artwork, whether for Carmel or New Orleans, in his studio there, preferring the quiet inspiration of the Santa Lucia Mountains to the hectic pace of his otherwise public life. In 1986 seventeen hatchlings became the first white alligators ever recorded, when they were found by chance in the Louisiana swamps. The Louisiana Land and Exploration Company discovered the 9-inch babies in their nest, rescuing them before predators took notice of the glowing animals. Now full-grown and on view at several habitats across the United States, including the Audubon Zoo in New Orleans, the alligators are not albinos, but rather have a rare genetic condition called leucism. Their piercing blue eyes contribute to their exotic appearance and mystique. 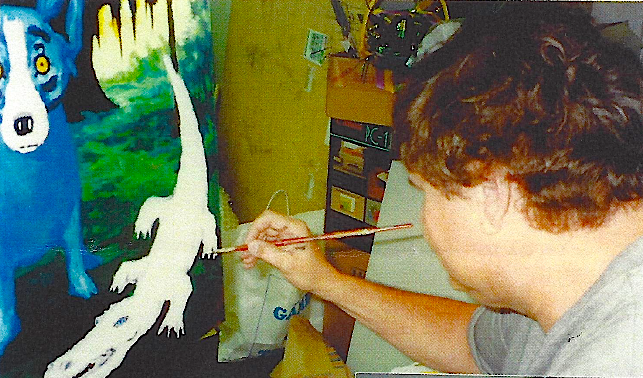 George, like many, was fascinated by this remarkable discovery and viewed the alligators often, eventually painting Spooked by Bourré in 1993 --- his only painting ever of a white alligator. 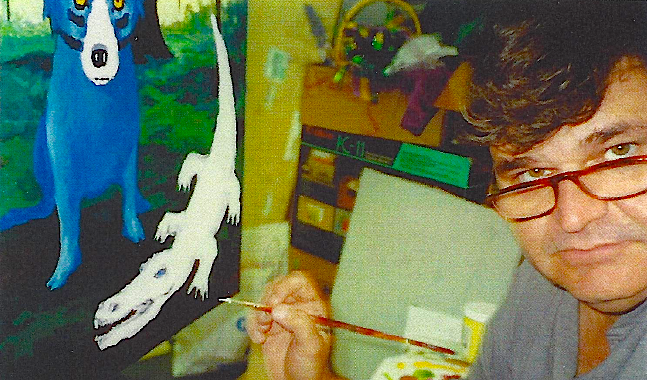 He called the alligator in his painting Bourré after one of the young white alligators named after the popular Cajun card game and now living in a south Florida zoo. George painted this mysteriously-colored alligator and its Florida palm tree alongside his own mysteriously-colored Blue Dog and his Louisiana live oak.